Ali studied at the University of Colorado (Boulder) and Colorado State University, Fort Collins in the USA, majoring in Biology/Zoology and Captive Wildlife Management. In 1977, he joined the Kenya Wildlife Services as a Research Assistant and later earned the title of Senior Assistant Director supervising all Regions. In 1998 Ali was awarded the Kenya Order of the Grand Warrior for achievements in anti-poaching, rhino capture and intelligence work. In 2001 Ali left the Kenya Wildlife Service and joined the East African Wild Life Society (EAWLS) as the Executive Director. From 2009 to present, Ali has worked with the International Union for Conservation of Nature (IUCN) as the Regional Director for Eastern and Southern Africa. Ali also served as Vice Chair of IUCN-WCPA (World Commission on Protected Areas), eastern Africa, as well as serving on a number of local Conservancy Boards and as a member of Kenya Ministerial Advisory Committees. In 2004 Ali received the National Geographic Society’s Howard Buffet Award for ‘Leadership in African Conservation’ and received the Meritorious award from IUCN – World Commission On Protected Areas in 2009. Mary Rice is the Executive Director of the Environmental Investigation Agency (EIA) in the UK. EIA investigates and campaigns against a wide range of environmental crimes and abuses, including illegal wildlife trade (such as elephant ivory, tiger parts and derivatives), illegal logging and trade in climate- and ozone-altering chemicals. Trained as a journalist, Mary spent 15 years working in Asia before moving to London and into the environmental sector. With more than two decades of experience in this field, Mary has extensive knowledge of the illegal international trade in wildlife, specifically ivory, acting as a spokesperson on the subject and attending major international meetings on the issue. The findings of EIA’s global investigations into the illegal trade in ivory played a key role in establishing the international ivory ban in 1989. Subsequent investigations into the trade of ivory of species threatened by the increasing demand for their parts and products have been pivotal in providing decision makers with empirical evidence of the reality of the burgeoning illegal international trade in wildlife. Mary is a fellow of the Royal Society of Arts and a published author and photographer. Heat, Dust and Dreams (Struik), an exploration of people and environment in Namibia’s Kaokoland and Damaraland, was the result of three years of research and photography in what is now known as the Kunene region, home to the last viable population of black rhino outside a protected area. Dr Rob Brett has been Director of FFI’s Africa & Madagascar Programme since 2006, overseeing ca. 40 projects in 14 countries. After reading Zoology at Oxford, Rob studied the behavioural ecology of naked mole-rats in Tsavo NP for his doctorate, but has been a rhino conservation specialist since 1986 and a member of IUCN’s African Rhino Specialist Group for the past 20 years. He has served on the senior staff of two wildlife authorities, as national Rhino Coordinator in the Kenya Wildlife Service (KWS: 1989-95) where he was responsible for the development and stocking of several of Kenya’s successful rhino sanctuaries, and as Senior Wildlife Biologist in the Botswana Department of Wildlife and National Parks (DWNP: 2000-01), and has also lived and worked in Namibia and Zimbabwe. Before joining FFI in 2004, Rob coordinated a regional programme for rhino conservation in ten southern African countries under the umbrella of the Southern African Development Community (SADC). Susan is a Research Associate within the University of Oxford’s Department of Zoology, specialising in conservation biology. 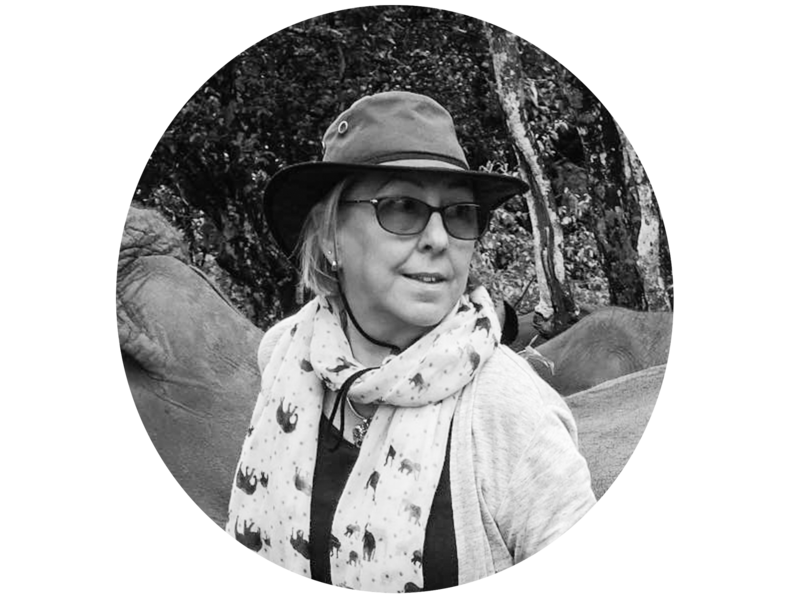 She has worked on a variety of nature conservation projects in Africa, Asia and Europe, and is the General Adviser and Project Leader for the Tusk-supported Mali Elephant Project. Susan’s research looks at how people interact with wildlife and ecosystems, and how sustainable solutions can be found to conservation problems, such as human-wildlife conflict. Susan has been a Trustee of Tusk since December 2014. Nigel joined Earthwatch in July 2005 and was appointed Executive Vice President in 2008. Prior to that he was the Deputy Director and Head of the Expeditions and Fieldwork Division at the Royal Geographical Society in London. Winser trained as a Life Scientist at Westminster University where he gained international field experience as an undergraduate. He first joined the Royal Geographical Society as a Deputy Field Director in 1976 for the society’s Gunung Mulu project in Sarawak. He helped establish the society’s Expedition Advisory Centre and was then selected to develop its international field research programmes in Africa, the Middle East, Asia, Australia and the Indian Ocean. For his services to fieldwork, notably in Oman, he was awarded the Patron’s Gold Medal of the Society in 1988 and the Mungo Park Award of the Royal Scottish Geographical Society. In 1991 he was appointed Deputy Director, becoming responsible for a wide range of programmes and society activities. As Head of the Expeditions and Fieldwork division, Nigel was involved in developing standards and training for safe fieldwork and promoting the value of outdoor learning. Nigel has been on the board of several geographical and conservation bodies, including the IUCN UK committee, the UK Man and the Biosphere committee, the Mount Everest Foundation, the British Airways Tourism for Tomorrow committee, Friends of Conservation (Chair), the Field Studies Council and the Global Canopy Programme. Nigel’s principal expertise lies with interdisciplinary and international purpose-led fieldwork, community based nature conservation approaches, and corporate engagement with environmental issues. Nigel was awarded an honorary degree of Doctor of Science from Westminster University for his services to the environment and conservation. Charlie Mayhew began his working life in 1981 as a Marine Insurance Broker at Lloyds of London with Dumas Ltd. In 1984 he persuaded Willis Faber to sponsor him to organize a major expedition across Africa as part of the UN’s International Year of Youth. After 18 months of planning, the 33 strong team led by Mayhew departed London bound for Africa and with the personal backing of the then Prime Minister, Margaret Thatcher. On his return from Africa, Charlie was elected a Fellow of The Royal Geographical Society and made a member of the Scientific Exploration Society. In 1988, Charlie formed an independent financial service business and in 1990 he co-founded Tusk Trust with the actor Timothy Ackroyd. In collaboration with Ackroyd, he co-produced the feature film ‘Lost in Africa’, a drama produced to highlight the horrors of the ivory trade. In 2002, Charlie stepped down as a Trustee to become Tusk’s first Chief Executive. In recognition of his services to conservation in Africa, Charlie was awarded an MBE by Her Majesty The Queen in December 2005. Beatrice is a strategic communications specialist with over 25 years of experience covering the African continent as both as journalist for BBC and Reuters and as a communications professional with UNICEF, Oxfam, and African Wildlife Foundation. As a PR professional at Portland Communications, Beatrice had the opportunity to consult for Mo Ibrahim Foundation, Kofi Annan Foundation, and the Bill & Melinda Gates Foundation. With roots in Kenya and Uganda, Beatrice continually strives to build strong partnerships that address the balance between Africa’s development and its conservation priorities. A communications graduate of Duquesne University, Beatrice also serves as a board member to Kenya Wildlife Trust, Mara Elephant Project and S.A.F.E. Kenya. Endangered since the 1970’s, the Grevy's zebra has a global population of just 2,000 – surviving only in a few protected areas.